Do good associations make good neighbors? There is a good chance that you belong to a community association, now or in the past, or know people who do. Last year, there were over 1,600 registered associations representing over 156,000 apartments in Hawaii, according to the 2012 Annual Report of the Hawaii Real Estate Commission. That doesn’t count the community associations for homes, townhouses, and new developments. I thought I’d take a moment to reflect on whether we need these community associations and how we can be good neighbors. * To take care of common areas such as entryways, hallways, landscaping, elevators, and parking lots. * To manage common amenities such as security, recreation rooms, swimming pools, and parks. * To keep up property values by overseeing the quality of exterior residences and landscaping. I belong to a community association in Hawaii. I’ve been managing the association’s website, and last year I stepped up and joined the board of directors. 1. The association is a business. This was a new perspective for me; I always thought that we are community first. But the association’s job is to make sure that everything runs smoothly and fairly. It is not about keeping maintenance fees as low as possible. 2. Know the financials. Associations should have a 20-year cash flow plan, and expenses should be paid without using deposit accounts (which must be returned to the homeowner) or reserves (which are used for repairs and renovations). Associations should conduct a reserve study at least every 10 years. Whether you are on the board or not, you should read the financial report every year. 3. Manage the meeting. Whether it’s a board meeting or an annual meeting, publish an agenda – and stick to it. Redirect questions and comments to the appropriate place in the agenda. To help the meeting proceed quickly, hold an “Owner’s Forum” at the end of the annual meeting to listen to grievances or issues, after the “business” of the association. 4. Communicate often. Board members: get information to homeowners quickly, make sure you have an updated website, and respond promptly to questions and concerns. Homeowners: show up for meetings, talk to board members if you have a concern (most of us want to help), and remember that board members are volunteers and your neighbors. “Good fences makes good neighbors,” wrote Robert Frost in his poem, “Mending Wall.” Do you think community associations make us better neighbors? What do you think about the Honolulu law that allows the city to tell us how to maintain the exterior look of our homes? What are your experiences with community associations? Just a year ago, I started learning about ceramics and the pottery wheel. It’s incredibly rewarding to take a block of clay and turn it into a beautiful, finished piece, make with patience, determination, and creativity. On Friday, April 26, you can join with local potters and neighborhood restaurants to add beauty to your lives and fight against hunger. Empty Bowl Hawaii 2013, presented by the Hawaii Potters’ Guild, will offer 5,000 hand-crafted bowls, donated by local artist groups like Ala Wai Arts and Crafts, Friends of Koko Head, and the Hawaii Potters’ Guild. Neighborhood restaurants like Big City Diner, Roy’s, and Side Street Inn are donating soup and bread. The event starts at AlaMoanaCenter’s makai parking area (near Sears) at 6 pm. Purchase a hand-crafted bowl ($20 through advanced ticket sales, $25 on the night of the event), choose your soup from over 21 restaurants, and support Hawaii Meals on Wheels. Remember that there are always Empty Bowls in the world. How full is your bowl? 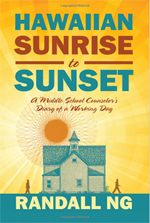 How can we help others fill their bowls and also their lives? Every year, Americans celebrate Earth Day on April 22 and show our support for a healthy, sustainable environment. Everything we do to help the earth will help us all, whether you pledge to recycle more, use less water and electricity, or re-use instead of throw things away… whether you decide to learn more about the environment and sustainability… whether you volunteer to clean our parks or beaches… Each one of us can make a difference and help make Hawaii better. * April 18: Learn about Food Security! On Friday at 6:30 pm, learn about food security with Russell Kokubun, chairperson of the Hawaii State Department of Agriculture, at Hanauma Bay. * April 19: Visit the 2013 Earth Day Fair! On Friday, 10 am to 4 pm, visit the Hawai’i Community College’s 25th Annual Earth Day Fair on the Manono Campus in Hilo. Free and open to the public. * April 20: Have tea at the Mad Hatter Garden Party II! On Saturday, 4:30 to 8 pm, join Livable Hawaii Kai Hui at the O’ahu Club in Hawaii Kai for a fundraiser with good food, fun, and music. Proceeds benefit the Maunalua Communities Foundation and the Hāwea Heiau Complex and Keawāwa Wetland restoration project. * April 20: Learn about sustainability at the Grow Hawaiian Festival! On Saturday, 9 am to 3 pm, at the Bishop Museum, learn about Hawaiian culture, native plants, and sustainable lifestyles at the Grow Hawaiian Festival. Free for kama’aina and military families with ID. * April 20: Help clean up Hawaii! On Saturday, there will be Earth Day Cleanups at Pyramid Rocks (Kaneohe Marine Base), Shorebreaks/Greenwalls (Kailua), Kalama Beach Park (Kailua), Kailua Beach Park, Lanikai Beach, Bellows (Waimanalo), Sherwoods (Waimanalo), Waimanalo Beach Park, Kaupo Bay (across from Sea Life Park), Makapu’u, and Sandy Beach. Check with beach coordinators for times and details. After the cleanup, there will be a Sea Life Park After Cleanup Music Festival from noon to 4:30 pm, admission $5 for volunteers. * April 20: Celebrate Earth Day at Windward Mall! On Saturday, 10 am to 2 pm, visit Windward Mall for Ka Maka o Kaloli Aniau: The Face of Climate Change. There will be activities, information, and entertainment. * April 21: Celebrate Earth Day at the Children’s Discovery Center! On Sunday, 10 am to 3 pm, celebrate the planet with recycled and nature-inspired activities. General admission is $10. * April 22: Recycle it! On Monday, 9 am to 1 pm, drop off recyclables at the Prince Kuhio Federal Building (GSA) in Honolulu. You can also bring canned goods to support the Hawaii Food Bank. Please check the list of items that will be accepted. * April 29: Go Green! On Monday, 9 am to 1 pm, Kailua High School will host Going Green #6. Please check the list of items that will be accepted. * April 27: Learn about lo’i building! On Saturday, 9 am to noon, learn how to construct proper growing areas for wetland kalo (taro) from kalo farmer Anthony Deluze at Ka’onohi Lo’i in Pearl City. Cost is $10 per person or $25 per family of 3. * Pledge an act of green. More than 50 million tons of electronic waste (electronics, computers, printers, phones, appliances) are thrown away each year in the US alone. Recycle your e-waste in a safe and responsible manner and join the Billion Acts of Green movement. * Host an Earth Dinner Party. Whether it’s a picnic, a potluck, or a dinner party, you can choose local, seasonal ingredients that are fresh, flavorful, and organic. Start a conversation about how and where foods are grown. Create a seasonal centerpiece and use seed packets or mini herb pots as party favors. * Try Meatless Mondays. Going meatless once a week may reduce your risk of chronic preventable conditions like cancer, cardiovascular disease, diabetes and obesity. And Mondays are a great day to start and sustain positive lifestyle changes. What will you do to help the environment? What are your best ideas for helping keep Hawaii green? I originally published this post on April 6, 2010. For those of you who are new to Better Hawaii, and for all of us who could use a reminder, I think it’s worth repeating. Let’s ignore, for the moment, the fact that the IRS tax code is over 44,000 pages, is so complicated that even tax experts don’t understand it, and desperately needs simplification. Let’s ignore the benefits of a national sales tax or a flat income tax. Think about this: like a tree struggling to shade us from harm, our tax system needs more sunshine, more pruning, and a lot less graft. In fact, we are growing the wrong tax tree entirely. Our current tax system is an overgrown banyan tree, with roots extending down and spreading over the whole economy. The federal government has higher income tax rates, ranging from 0% to 35%. The states have lower income tax rates, ranging from 0% to 11% – with Hawaii at the top – but are dependent on federal funds and must comply with unfunded mandates. 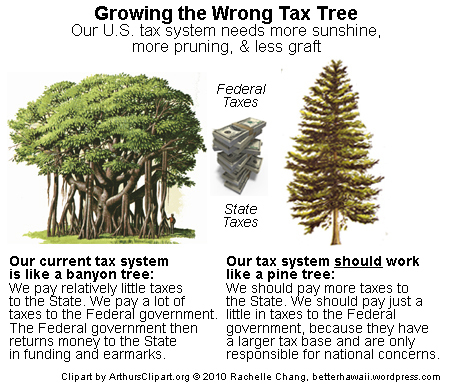 It makes more sense to have a tax system like a strong pine tree, simple and orderly. The federal government, which has national responsibilities and a larger tax base, should have lower tax rates. The states, which directly care for citizens but have smaller tax bases, should have higher tax rates and not rely on the federal government for funding. The only rational explanation for this upside-down, overgrown tax code is that the federal government wants the power to redistribute taxes among the states. They want to create welfare states and ensure that states are dependent on the federal government. Does this make non-sense? Do you have another explanation – or better yet, solution? Does anyone have ideas about how states can reclaim their power and independence from the federal government? So far, we’ve looked at proposed bills in the 2013 Hawaii Legislative session that affect taxes, education, citizens’ rights, spirited debate, the law on our side, and Native Hawaiian issues. As I wrap up this year’s legislative watch, I thought I’d list some of the minor and even trivial bills that I’ve come across. Here are 6 kinds of ideas proposed during the 2013 Legislative Session that I think should have a low priority with lawmakers. Isn’t there a way to separate the major bills from the trivial? If I’ve missed any un-important bills, please let me know! 1. “Official” passion: HB293 designates Flavobacterium a’ki’ a’.in’ viv.ens (akiainvivens) as the official State microbe. SB537 designates the Honor and Remember Flag as the State’s emblem of service and sacrifice. SB775 designates the Hawaiian hoary bat as the State land mammal. 2. “Awareness” and “Honor” mania: SB856 establishes January 30 as Fred Korematsu Day. HB1187 designates January as Human Trafficking Awareness Month. HB109, HB223, SB409, and SB469 designate February as ’Olelo Hawaii Month. HB1431 designates August 4 as President Barack Obama Day. HB1427 designates September 7 as United States Senator Daniel K. Inouye Day. HB1089 designates October as Kalo Appreciation Month. HB1433. SB1359 designate October as Non-violence and Peace Awareness Month. HB1159 and SB317 re-designate the second Monday of October from Discover’s Day to Indigenous Peoples’ Day. HB530 designates November as Homeless Awareness Month. 3. “In Honor of” renaming frenzy: HB686 and HB1428 renames the HonoluluInternationalAirport to the Daniel K. Inouye – HonoluluInternationalAirport. HB751 and SB50 rename Saddle Road to the Daniel K. Inouye Legacy Highway. SB100 renames the East-WestCenter to the DanielK.InouyeEast-WestCenter. SB925 renames Mokulele Highway on Maui as the Daniel K. Inouye Veterans Highway. 4. Inscription changing and department renaming: HB1272 renames the Department of Health to the Department of Health and Environmental Services. SB233 changes the inscription on the Queen Lili’uokalani statue to the dates of her coronation and death. SB423 renames the AmericanCollege of Obstetric and Gynecology to the AmericanCollege of Obstetricians and Gynecologists. 5. Inconsequential regulations: HB36 converts Hawaii to the metric system. HB1041 restricts the hours that you can use leaf blowers. HB1341 says it is “not unlawful” to own an antique slot machine, if it is not used for gambling. HB1464 establishes “less burdensome licensing requirements” for hair braiding. Are bad braids a fashion crime? SB482 regulates the amount of honey that is sold without a permit. 6. Civil nuisances: HB15 makes it a crime for personal injury or property damage caused by feeding feral birds. HB33 and SB808 prohibit public urination and defecation in downtown Honolulu. But it’s okay everywhere else? SB743 prohibits the keeping, breed, or harboring of feral pigs. Are domestic pigs allowed? SB279 makes it a crime not to maintain your property. How much influence should our neighbors have on the way our homes and lawns look? HB1121 and SB7 prohibit selling dogs and cats in public spaces, except for humane groups. Does this happen a lot? Why is it a crime? Please think about these issues and how they may affect you and everyone around you. If you feel strongly about an issue, speak out! Talk to your family and friends, let your Hawaii legislators know about it, and write letters to the local newspapers. You are currently browsing the Better Hawaii weblog archives for April 2013.